The NASP 2010 standards are a unified set of national principles that guide professional practices, credentialing, graduate education, and ethical behavior of effective school psychologists. These major NASP policy documents are intended to define contemporary school psychology; promote comprehensive and integrated services for children, families, and schools; and provide a foundation for the future of school psychology. NASP Standards are reviewed and revised approximately every 10 years. Learn more about the multi-year Standards revision process currently underway, with an anticipated vote for approval in 2020. The Standards for the Credentialing of School Psychologists are intended to be a model for state education agencies or other state or local entities, with recommended criteria for initial credentialing as well as recommendations for credential renewal. The standards also include a description of the Nationally Certified School Psychologist (NCSP) credential. The NASP Standards for Graduate Preparation of School Psychologists identify critical graduate education experiences and competencies needed by candidates preparing for careers as school psychologists. Graduate education of school psychologists occurs through specialist-level or doctoral-level programs of study in school psychology. The NASP Principles for Professional Ethics address the unique circumstances associated with providing school psychological services. The Principles, like all codes of ethics, provide only limited guidance in making ethical choices. Individual judgment is necessary to apply the code to situations that arise in professional practice. 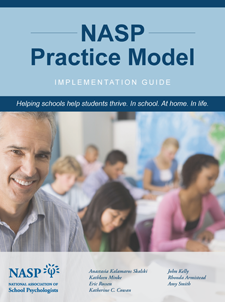 The NASP Practice Model Implementation Guide is designed to help school psychologists and other school decision-makers align school psychological services with the comprehensive role defined by the NASP Practice Model. This self-assessment tool was created by NASP to help you focus attention on your individual work activities in terms of the 10 domains outlined in the NASP Practice Model. A personalized summary will automatically be generated for you after you have completed the survey.